Such a great quote! Can't tell you how many times I've gone out of comfort zone, been all kinds of turned around and unsure, but always find my way. When I went to South America for the first time, friends and family thought I was nuts. When I arrived in Lima, not my favorite city, exhausted from the flights and not speaking the language, I went straight to my room at the hostel and cried for a bit. I was feeling like maybe I had bit off more than I could chew on this particular adventure. Then I pulled myself together, thinking, "You can do this. You are not going to waste this trip hiding in your room. Spanish or no Spanish, you have got this." Then I grabbed my cleverly disguised Lonely Planet guide and phrasebook and headed into the city. Though Lima remained my least favorite city in Peru, the trip was one of my favorites. It's also a wonderful thing to learn to rely on your intuition. 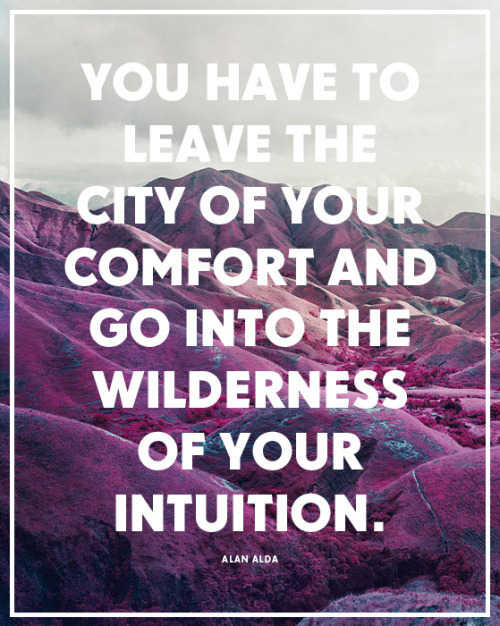 It's harder to hear it and need it while hanging out in your comfort zone. Outside of that, you learn to trust yourself and how to make your way out there in the great big world.